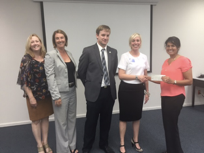 On Thursday, April 27, 2017, the Gulf Coast Chapter of the National Defense Industrial Association (NDIA) presented the University of West Florida (UWF) a check for $25,000 to complete the NDIA’s fourth $100,000 endowment to UWF. The four scholarship focus areas are: two for Science and Engineering, one for Teaching STEM subjects, and one for Cybersecurity. Accepting the check on behalf of UWF were Dr. Meredith Brunen, Interim VP for Univ Advancement; Dr Michael Huggins, Dean of College of Engineering; and Meredith, chief of Donor Relations. Presenting on behalf of the NDIA board were Ms. Missy Ward, Gulf Coast Chapter President; and Ms. Theresa Hughes, Scholarships Committee Chairperson. These 4 separate scholarships have enabled an average of 6-10 students (per semester!) at UWF to pursue STEM curriculum and foster/grow the talent pool in our local area. 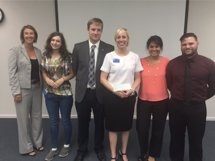 Attending the UWF reception were two students who are previous NDIA scholarship recipients: Ms. Gabriella Gressett, and Mr. Devin Wisdom.